Cooper's Corner offers a tour of a miniature city and teachs children safety. Kids can take control of city traffic signals, practice crossing guard skills, learn how to fit a bicycle helmet, meet a crash test dummy, and even visit the local health and safety clinic. 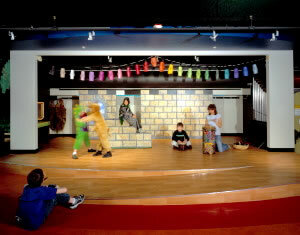 The Globe Theater lets kids step into the spotlight! This gallery houses a stage for impromptu and planned plays, dances and performances. Features real stage backdrops and lighting, costumes and musical instruments. The Enchanted Forest is designed specially for toddlers features a tree house, a tree slide, a foam pond, and woodland-animal puppets. Bayanihan is a Filipino village which allows young visitors to explore another culture. Explore Filipino culture by bargaining at the sari-sari store, shopping at the local fish market, and husking rice in the bahay kubo. Geotopia is an installation with stream and erosion tables which explore the combination of water and weather and its relation to the ecosystem. An insect area features hissing cockroaches, rose hair tarantulas, crickets and ants, Oh Boy!!. Out-of-Hand Art Studio lets young minds create with areas to paint, draw, use chalk and sculpt with clay and found objects. Kids can create their own masterpiece! 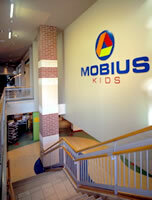 Entertainment, creativity and education go hand in hand at Mobius Kids. 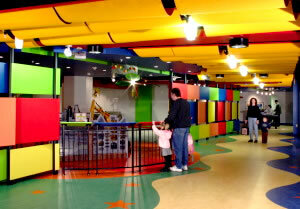 Come visit and watch in wonderment as your children are encouraged to explore, discover, and create.